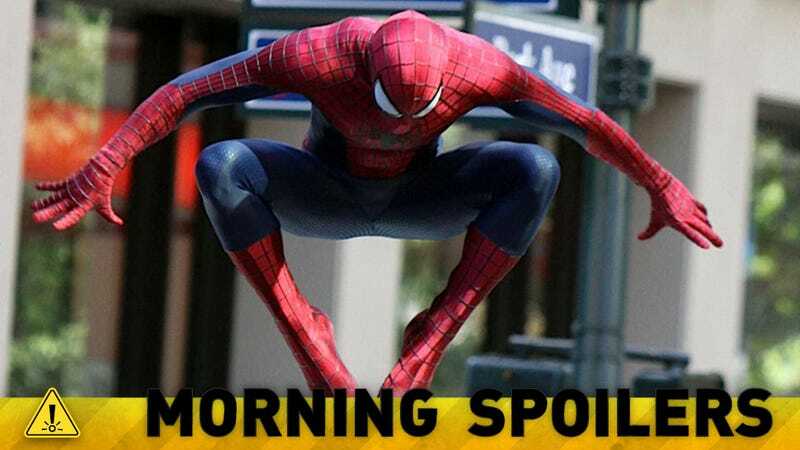 Could the Amazing Spider-Man sequels have more villains than we knew? Marvel's Ant-Man is a "heist movie." Kristen Stewart could star in another fantastical romance. The Mortal Instruments sequel may be happening after all. Get your first look at a major Outlander character. Whoopi Goldberg is lending her voice to Once Upon a Time in Wonderland. Spoilers ahead! A trial date has been set in the New York Appellate Court for alleged bio-terrorist Dr. Curt Connors. The former Oscorp biogenetics scientist has been indicted on twenty city and state counts, including trespassing, malicious destruction of property, theft of private property, aggravated assault, and using a weapon of mass destruction. Connors has pleaded “not guilty” to all counts. It is expected his defense attorney, Anne Weying, will claim Connors was not responsible for the actions of his genetically transformed alter ego, the Lizard. The fan response, from the blogosphere and the thousands of mails we have received, has encouraged us to keep going. It's been overwhelmingly positive, in contrast to some other YA titles. We are analyzing what we did wrong with the first film — particularly with the positioning and marketing — and what changes we have to make. We are working with a great group of people to reposition the franchise [for City of Ashes]. It is an ongoing discussion that we are having, and it is not done. We haven’t made a final decision. But we will only move forward — and we plan to move forward — when we feel we are going to get it right... That is the plan, but it is not a given. Well, I think folks know that Titus [Welliver], who played Agent Blake, is coming up in episode six [on November 5]. The short answer is yes. But we’ve said from the very beginning, we didn’t do the show in order to make an Easter Egg farm. We want to make sure that if there are going to be characters, things, winks, that come from anywhere, whether it’s the regular mythology of the comics or the Marvel cinematic universe, that it works within the story. That we’re not doing it just to do it. When I look at Cobie [Smulders]’s appearance in the pilot as Maria Hill, it was really important that the person who reintroduced Coulson into the world was Maria Hill. We needed someone who had the gravitas of one of the major characters from the [Avengers] movie being able to say, “There’s a secret, and we’re not going to be able to share that secret with you, but we’re going to take you on the journey with us.” … If you were part of the Marvel family to begin with, it landed for you in a very different way. What can you say about next week’s episode? Episode 4 is called “Fearful Pranks Ensue.” Kathy Bates is very confused about Halloween and when she finds out it’s Halloween she wants to go out and burn a bonfire in the front yard to keep the evil spirits away. We’re doing a real Marie Laveau/white zombie tribute. I recently watched again that movie I Walked with a Zombie. I always loved that movie and the voodoo zombies are very different from The Walking Dead zombies. It’s a very gripping two-parter. So we’re going to see voodoo zombies on American Horror Story? You are. Specifically you’re going to see Madame LaLaurie’s three horrible daughters brought back. In part 5, the second part, there’s a brilliant thing that I love of Kathy Bates. You see how Madame LaLaurie used to celebrate Halloween — she had her own chamber of horrors in her dining room that she would make her Halloween ball guests go into. It also is really about how the character of Zoe really comes into her own and helps save the coven. So does Zoe defend the coven from the zombies? Yes, and with Madison out of the way I think all of the remaining girls are like, ‘Well was Madison the Supreme?’ So there’s that battle to stop Jessica. We get into that a bit. Cordelia has a horrible, horrible event that may be one of the hardest things Sarah Paulson has ever shot, which is saying something on this show. It’s plucked from the headlines! FOR THE BEST FANS IN THE WORLD. Here's what your wee hearts have desired. James Alexander Malcolm MacKenzie Fraser. It's funny, the most dramatic thing we did was simply follow what Bram Stoker said and that's stakes don't kill vampires. It puts them in suspended animation and the only way to kill them is by decapitation or exposing them to sunlight. Otherwise, they get better. Beyond that, I think what audiences will find is that there are myths about vampires that people fall for that are not true and there are rules about vampirism that will be turned on their head a bit. How much of Adalind's identity is wrapped up in her powers? Claire Coffee: I think all of it right now. That was the hardest thing for her when losing her powers was that she felt really unhinged. She has no allies, no family, no friends, so until she gets those powers back, she's floating. Is Shohreh Aghdashloo's character Stefania still around when we return? Coffee: Yes she is. Shohreh is the direct link to getting those powers back because she's the one who knows the rituals. She has all of the spells and potions to get her there. So Adalind needs Stefania more than ever. What details about the rituals can you share? Coffee: You'll see that the first episode of the season is when we have Frau Pech (Mary McDonald-Lewis), whom Stefania, at the end of Season 2, has murdered with a sword through the chest. So Adalind comes at the beginning of Season 3 to meet up with Stefania in order to complete that process. So we know that we need a beating heart of a Hexenbiest in order to get those powers. And that's just the beginning. We finally know who will play Jonathan Strange & Mr. Norrell! I can't wait to start playing Norrell in this terrific adaptation of Susanna Clarke's novel, and to be working with such a cast of actors, many of whom I've admired for so long. I read the book some years ago and was totally enchanted. I've been casting spells for the part of Strange ever since. It is a considerable surprise to find that some of them worked! "My name is Sam, I can fly"
"You come anywhere near my husband or son again and I will kill you"
"He thinks I'm at university with a bloody Master’s Degree in Computer Science"
"This Cinderella, did you shag her?" FAMILY BONDS —- When Stephen (Robbie Amell) and Russell (Aaron Yoo) head out for a night of fun, they run into a potential new break-out. Stephen and Russell report back to John (Luke Mitchell) and Cara (Peyton List) about the new person, but they want to keep a low profile from Ultra. Sadly, Russell learns that his dad has passed away and he is torn about whether or not he should go home. John volunteers to accompany Russell to help keep him out of trouble. Meanwhile, Jedikiah (Mark Pellegrino) has a shocking secret that could destroy his career. Madeleine Mantock also stars. Nathan Hope directed the episode written by Jeff Rake and Ray Utarnachitt (#106). MILES CONSIDERS THE CONSEQUENCES OF MONROE'S ACTIONS - As Charlie (Tracy Spiridakos), Rachel (Elizabeth Mitchell) and Gene (Stephen Collins) question Monroe's (David Lyons) true allegiance, Miles (Billy Burke) himself is weary of his former friend's intentions. Meanwhile, Aaron (Zak Orth) continues to have visions that lead to endless questions. Also starring Giancarlo Esposito, JD Pardo and Nicole Ari Parker. CASTIEL GETS A JOB —- Castiel (Misha Collins) gets a job at a Gas-N-Sip and actually starts to enjoy life as a human. A headline in the local newspaper about some disappearances in the area catches his eye, so he calls Dean (Jensen Ackles) to help him investigate the case. Dean knows he needs to keep Sam/Ezekiel (Jared Padaleck) away from Castiel, so he tells Sam that he and Kevin (guest star Osric Chau) need to stay and work with Crowley to decipher the tablet. Crowley agrees to help Sam and Kevin but in return he wants one phone call to hell. Rob Spera directed the episode written by Robert Berens (907). THE POWER OF DOPPLEGANGERS —- While Elena (Nina Dobrev) and Damon (Ian Somerhalder) try to explain Amara's (Nina Dobrev) situation to Stefan (Paul Wesley), Dr. Wes (guest star Rick Cosnett) gives Katherine (Nina Dobrev) some deeply disturbing news. Nadia (guest star Olga Fonda) shows up at Caroline's (Candice Accola) dorm room, searching for Katherine. After a surprising conversation with Amara, Jeremy (Steven R. McQueen) and Bonnie (Kat Graham) share a glimmer of hope. Silas (Paul Wesley) fails to keep a promise, causing Damon to turn to Tessa (guest star Janina Gavankar) for help with his new plan, and Stefan makes a heartbreaking confession to Damon and Elena. Leslie Libman directed the episode written by Rebecca Sonnenshine (#507). Dyson searches for an elemental Fae to save someone he loves.